I’m talking about a wife as in someone who is there to support you, inspire you and be there for you in sickness and in health. All you have to do is join the online group called A Band of Wives (ABOW) and you are instantly married to a supportive group of wonderful women. Seriously, it is that easy. A Band of Wives was founded by the amazing Christine Bronstein. I joined back in February when I discovered them via the Marin Magazine article about online communities that we were both featured in. At first I didn’t know if this was the right group for me. I was a little intimidated by all the hip, beautiful and successful women. Then I attended a few of their events and realized they were also friendly, genuine, authentic and caring women. You can’t judge a book by it’s cover. 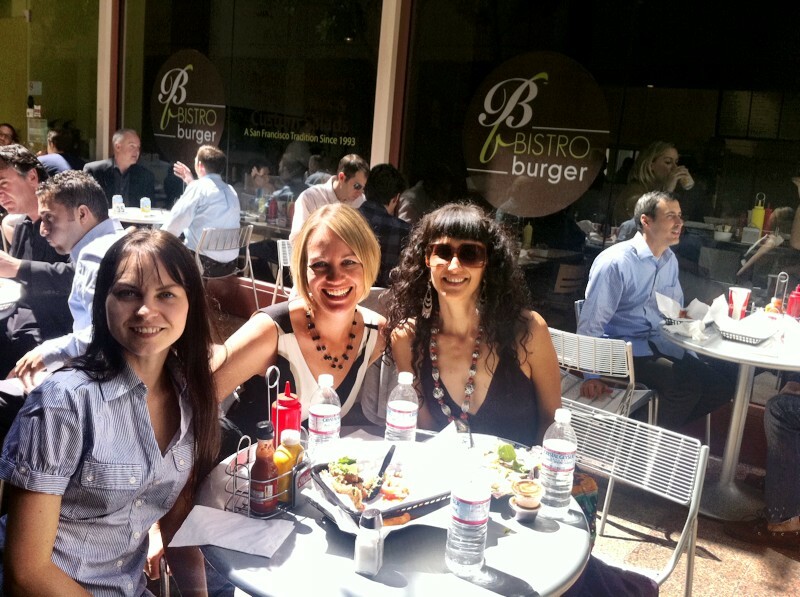 A few weeks ago, I discovered Bistro Burger in San Francisco. I loved their turkey burgers SO much, I went there 3 times that week. They had one of those fishbowls on the counter where you put your business card in for a chance to win a free lunch. I never put my business cards in those things but for some reason I decided to this time. The next day I got an email saying, “Congratulations you won a free lunch for 4 at Bistro Burger”. I was super happy but was wondering who I was going to invite. I didn’t have 3 friends in the financial district who would be available to lunch. This was about the same time I had the realization that my only real complaint about my job was that I really missed those coffee and lunch dates I used to have in Marin with my Twitter friends when I was self employed. I remembered super-star wife Leila (@mizbohemia), the Director of Operations at A Band of Wives, lived in the city, so I invited her to join me for the free lunch. She agreed. Then I got the idea to ask on Twitter who works/lives in downtown San Francisco and I got a response from someone who just happened to also be a member of ABOW! 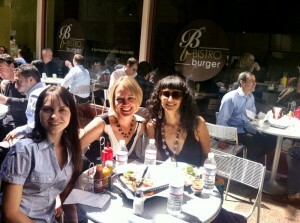 Shasta (@girlfrndcircles), owner of GirlFriendCircles.com and I invited her to join us for lunch. She said yes! We had room for one more at lunch so Shasta invited Jessica (@50womenproject), author the 50 Woman Project and she said Yes! It was a nice day so we sat outside. Our little lunch turned in to a 3 hour magical, brainstorming session. We ended our lunch full of ideas and inspirations for our own various projects. It’s amazing how the power of group intelligence can get you unstuck from a rut. That’s what A Band of Wives is all about; connecting women, and igniting the spark in all of us. Thank you Twitter, Bistro Burger and A Band of Wives for connecting us! I told you they were all hip, beautiful and successful! THANK YOU for a wonderful invite, a delicious lunch and your sweet and needed wifita company as well as the welcome company of Shasta and Jessica! It was a magical lunch and I only wish I could have stayed through the duration of the lunch instead of rushing off to dive back into motherhood duties! AND… I was remiss to say… THANK YOU for such a sweet and moving write-up. I am personally moved and grateful and I can say the same as a rep for, and lover of all things, ABOW as well… BIG love to you Sally! Thank you! Love that you’ve joined our fold, Sally. And yes indeed, with this group you cannot “judge a book by it’s cover.” I’ve had a blast with these women over the last few years…and looking forward to more good times. Octopusgrabbus – your wife sounds like a smart woman. She should join our group. It was GREAT Sally:) Thank you for such a great time! Sally– It was such fun to meet 3 people I had only known through Twitter. You made it happen girl! I’m super impressed with anyone who just jumps in and puts it out there. Thanks for sharing your win with us. Let me know if they put the photo of all 4 of us up– that’s the one I want! Hope you’re enjoying youu weekend!